It’s still hard to believe that Deathstroke is one of the best superhero comics being published right now. After multiple failed attempts to make Slade Wilson a compelling lead character in the New 52, DC Comics found the perfect writer for the supervillain in Christopher Priest, who has crafted a complex, twisting, character-driven story that focuses on how Slade’s actions impact his family. Turning Deathstroke into a supervillain Sopranos has allowed Priest to delve deep into the dysfunctional relationships Slade has with his ex-wife and children, but he doesn’t forget to include moments of thrilling action in the midst of all the emotional content. It’s an impeccably well balanced title, with evocative dialogue that makes the characters come to life and a multi-layered plot that constantly reveals surprising new elements. The current arc, “Twilight,” highlights that unpredictability by blinding Slade and giving him a new teenage partner, Tanya “Power Girl” Spears. In just three issues, Priest has made Tonya more interesting than every previous comic she’s appeared in since debuting three years ago, and she’s using her super-genius mind to help Slade acclimate to his condition. Just because he’s blind doesn’t mean he has to stop being a mercenary, and with a pair of special sunglasses and a service dog, Slade takes on the new name of Twilight and jumps back into the fight. This exclusive preview of this week’s Deathstroke #16 highlights Slade and his dog, Roscoe, in action, and it shows how important Larry Hama is in the book’s art team. Hama contributes breakdowns for the issues drawn the penciler/inker team of Carlo Pagulayan and Jason Paz, and Hama’s eye for clear, dramatic storytelling has given the book’s visuals a sharp focus. Deathstroke has been good about keeping the art teams consistent with its biweekly schedule, but this week’s issue features a second penciler/inker duo in Roberto J. Viacava and Sean Parsons. Luckily, Hama’s breakdowns and Jeromy Cox’s colors ensure that the switch between artists is very smooth, with Hama providing a strong foundation for both teams to build on while Cox unifies the finished art with his colors. 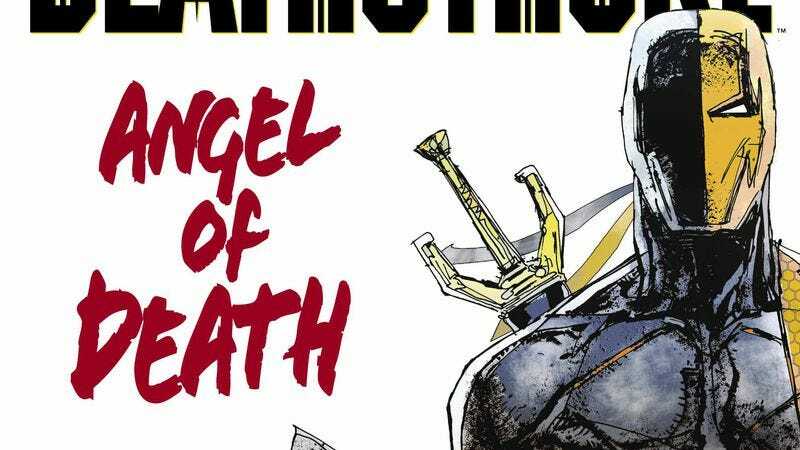 There’s a lot of intelligent craft in the pages of Deathstroke, and readers should seek it out if they want a superhero title executed with precision and depth.